(a) Disconnect the T22 television camera assembly connector. (c) Reconnect the rear television camera assembly connector. 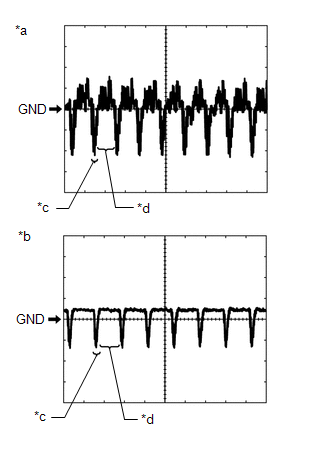 (d) Measure the waveform according to the value(s) in the table below. A waterproof connector is used for the rear television camera assembly. Therefore, inspect the waveform at the radio and display receiver assembly*1 or navigation receiver assembly*2 with the connector connected. If the result is not as specified, the rear television camera assembly may have a malfunction. (e) Using an oscilloscope, check the waveform. A waterproof connector is used for the rear television camera assembly. Therefore, inspect the waveform at the inner rear view assembly with the connector connected.